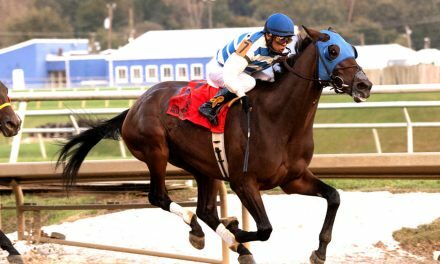 For three decades, the Jim McKay Maryland Million has been a highlight of the State’s racing calendar as well as a day to celebrate the Thoroughbred here in Maryland. Beginning as an innovative concept to showcase the Maryland Thoroughbred breeding industry, it has grown to be the second-biggest day on the race calendar, behind the Preakness Stakes. Since the inaugural running on October 18, 1986, Maryland Million, Ltd. has been held at both Laurel Park, where it currently takes place, and Pimlico Race Course. It has paid out more than $30 million in purses and awards. Horsemen, who Cricket Goodall of Maryland Million, Ltd says have reinvested much of that money, “recognize not only the long tradition, but also a confident future.” Goodall has been involved with Maryland Million day in some capacity since its beginning. Since the birth of the Maryland Million, 21 other states across the country and in Canada have created their own special racing days based on Maryland’s model. This Saturday, October 22, the 31st Jim McKay Maryland Million will take place at Laurel Park and will feature 11 races, nine of those stakes races, for horses by 107 stallions standing right here in Maryland and nominated to the Maryland Million program. Highlights for this year include such stars as 26-time stakes winner Ben’s Cat, who is aiming to win his fourth Maryland Million in the six-furlong Sprint. The millionaire and now retired Eighttofasttocatch, who won the Maryland Million Classic three times in four years, will perform on-track demonstrations of his new career between races. Shetland ponies will also run down the track in the ever-popular Shetland Pony Races circuit. General admission is free and commemorative hats will be given out with the purchase of a race day program. There are also several seating and dining options at the upgraded Laurel Park including the newly refurbished Ruffian Room. For more Maryland Million details, click here. Longtime Maryland veterinarian Dr. David Zipf has been selected to receive the 2016 Joe Kelly Maryland Million Unsung Hero Award, which will be presented by the Maryland Million Ltd. Board of Directors on Saturday. The annual award recognizes honesty, hard work and humility and celebrates important characteristics that are valuable but often unrewarded and serve as an inspiration to others. 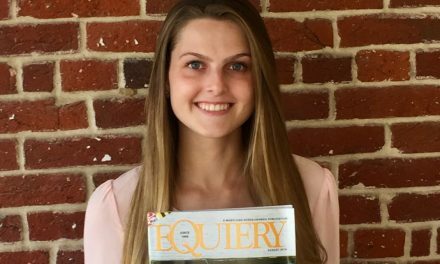 Dr. Zipf has worked for the Maryland Jockey Club for over 50 years and was featured The Equiery’s annual “People Behind the Preakness” article in the May 2016 edition. To read more about Dr. Zipf, click here. CANTER announced last week that it has launched a chapter right here in Maryland. Volunteers are visiting Laurel Park and Pimlico Race Course to offer free listings that include a photo, description and contact information, to trainers and owners looking to move their ex-racehorses into second careers. Amy Smith has been named as executive director of CANTER-Maryland. She has been a fixture at Laurel Park working with trainers for nine years. Laurel horsemen can contact Amy at amy.smith@canterusa.org. Pimlico horseman should contact Martha Gagne at Martha.cagne@canterusa.org. NEW! 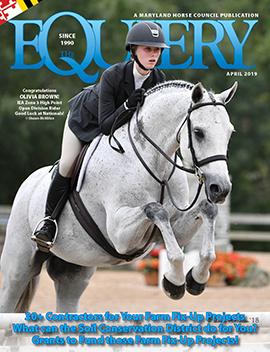 Digital edition of The Equiery now on line!